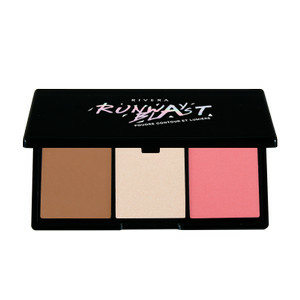 Three expert coordinated colors and textures to contour, color, and highlight the face. Create perfect cheekbones, definition, and warmth with the oversized and shimmer shades that blend beautifully for instant professional results. Talc, Aluminium Starch Octenylsuccinate, Methyl Methacrylate Crosspolymer, Mica, Zinc Stearate nylo-12, Carnauba (Copernicia Certifera) Wax, Titanium Dioxide, Cyclopentasiloxane, Synthetic Fluorphlogopite, Dimethicone, PCA Dimethixcone, Triethylhexanoin, Phenoxyethanol, Hydrogenate Polyisobutane, Ricinus Communis Seed Oil, Paraffin, Isoprophyl Palmitate, Dimethicone Crosspolymer, Methylparaben, Dimethicone Crosspolymer, Mineral Oil (Paraffinum Liquidum), Ozokerite, Propylparaben, Tocopheryl Acetate, Dimethicone/Methicone Copolymer, Dimethicone/Vinyl Dimethicone Crosspolymer, PCA Dimethicone, Hydrogen Dimeticone, Ethylene/VA Copolymer, Butyl Stearate, Euphorbia Cerifera (Candelilla Wax), Trimethylsiloxysillcate, Aluminuim Hydroxide, Cyclotetrasiloxane, Dimethicol. Alumina, Tin Ocide, aluminum Benzoate, Cl 77019, Cl 77891, Cl 158502, Cl 77499, Cl 77491, Cl 77492, Cl 45410.